Do Not Be Deceived | Bein' a Berean | Steven: bij de Leij. That symbol has even more nefarious origins. 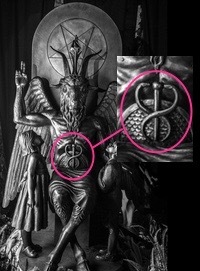 The statue below, called a Baphomet statue, show a very intimate connection to the medical establishment. Today the Baphomet is associated with Satan the one who made gods of mankind—a twisting of the words spoken to Eve. 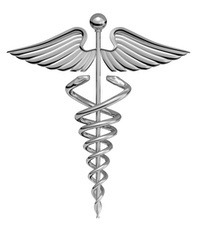 Intregal in the image of Baphomet is the essence of the medical caduceus as a phallic symbol. The late 19th and early 20th century coincides with steps orchestrated by illuminati leaders Carnegie, Morgan, and Rockefeller designed to take over health care with with money grants to schools amiable to their dictates. They pressed the introduction of pharmaceuticals—poisons which while giving relief from symptoms added a plethora of side effects for future treatment. Of the two main branches of medical practice today—trauma (breaks and wounds) and allopathy (disease and drugs) only trauma seems to be genuinely interested in helping. Allopathy is a disgrace with its stupid use of Latin names and its focus on life long treatment of conditions rather than cure or reversing disease. Do not be deceived, our modern medical business is interested in your wealth, not in your health.